On the day before I find out if Peace is an Offering will win the BC Book Prize in the Children’s Illustrated Literature category, I received a letter in the mail that meant as much to me as any literary award (though I’d be I thrilled if ‘Peace’ was chosen as the winner). The letter was from Shalia Swaggart, from Louisiana, a dear friend I’ve never met. I couldn’t hold back my tears as I read it. Shalia had contacted me a year ago after her son, Bailey, a young soldier in the military had died while serving in Africa. She’d told me she had been donating my children’s book to families and libraries as part of her healing. On the first anniversary of her son’s death, she and her husband, Kenny, recently travelled to Dover Delaware to receive their son back to the United States. They stayed at Dover Air Force Base’s Fisher House which is dedicated to the support for families of fallen soldiers. Each soldier of every branch of the American military returns to the U.S. through this facility. 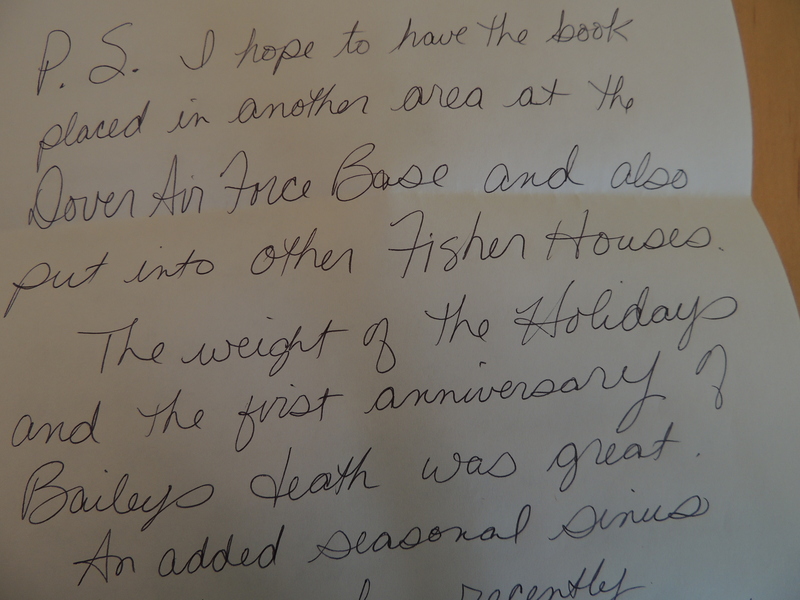 The letter I received today from Shalia contained birthday greetings to me, a handwritten letter from her and a letter from the Department of the Air Force Mortuary Affairs Operations written by the Chaplain and the Deputy Commander thanking Shalia for her donation of Peace is an Offering to the Fisher House Library. Shalia plans to donate ‘Peace’ to other Fisher Houses across the U.S. Writing is a lonely profession. I have always had a love-hate relationship with it. I get anxious if I don’t write, I’m driven to do it, and when my work is going well, I find joy in it. But it doesn’t always go well. Sometimes I hate what I’m doing because I’m often so often plagued with self-doubt and it doesn’t matter how many books I’ve had published or the number of awards or good reviews—nothing completely erases that feeling. But what my mind can’t deny is knowing that my words have affected a reader deeply. So when Shalia wrote to me that ‘Peace’ ‘Tis truly a lifesaver for me’ it makes the difficult times worthwhile. On another note: my daughter, Sara, mother of two wonderful young boys, passed on a book to me called A Mother’s Reckoning: Living in the Aftermath of Tragedy. Sue Klebold, the writer, is the mother of Dylan Klebold, one of the shooters in Littleton, Colorado, a young man responsible for the deaths of so many innocent people. This tragedy is markedly different from the death of Bailey in that according to everyone who knew him, Bailey was a gentle soul, who did no one harm. He was also serving his country. And yet, the agony of losing a son, no matter what the circumstances cannot be denied. My daughter, a psych nurse, was grateful to Ms Klebold, for sharing her story and for warning parents to watch for signs in their sons and daughters that something might be amiss and press them to talk. My daughter contacted Sue Klebold to tell her how her book would help her make good decisions as her young sons entered their teen years. I’m halfway through Klebold’s book and her grief as a mother is palpable. Reading it, I am struck by the power of words to heal. Thank you, Shalia, for reminding me of that.